I was late to the Instant Pot party, but once I finally caved and bought one (this is the one I have), I now understand why everyone loves the Instant Pot so much! … and I also learned how to cook spaghetti squash in the Instant Pot! … but I think the spaghetti squash in the un-sung hero of the squash family. Odds are you already know about the acorn squash and the butternut squash. And of course EVERYONE knows about pumpkin. But spaghetti squash? Not so much. 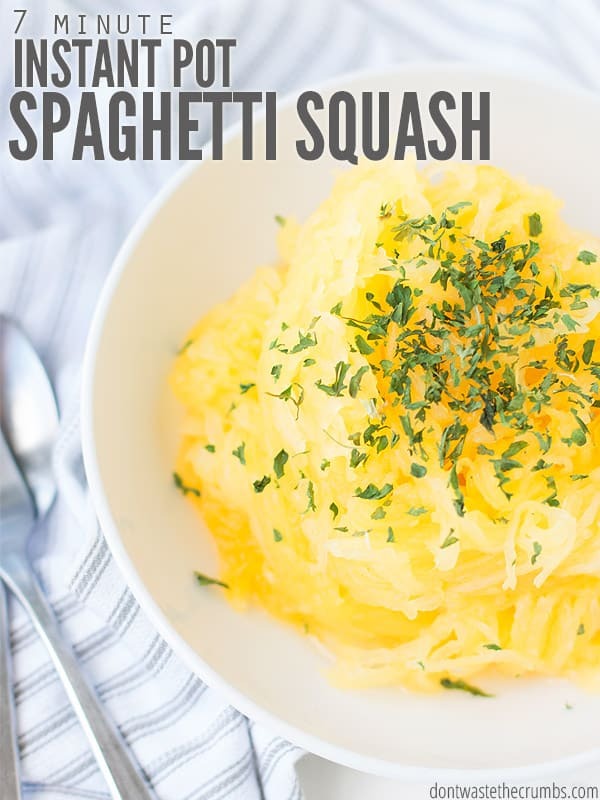 Like all the other winter squash, spaghetti squash is in season in the fall and winter. It’s yellow and has seeds in the middle, but the flesh is very different from other squash. Learning how to cook spaghetti squash is a basic kitchen skill, and one that I think many people get stumped on BECAUSE of those strands. And spaghetti squash tends to be too big to roast whole and stuff and then eat as an individual serving. 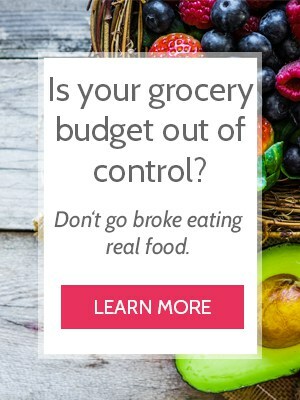 So that’s why I’m showing you how to cook spaghetti squash in the Instant Pot. 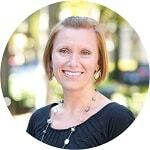 It’s SO easy, super fast and you get perfect spaghetti-like strands every time! 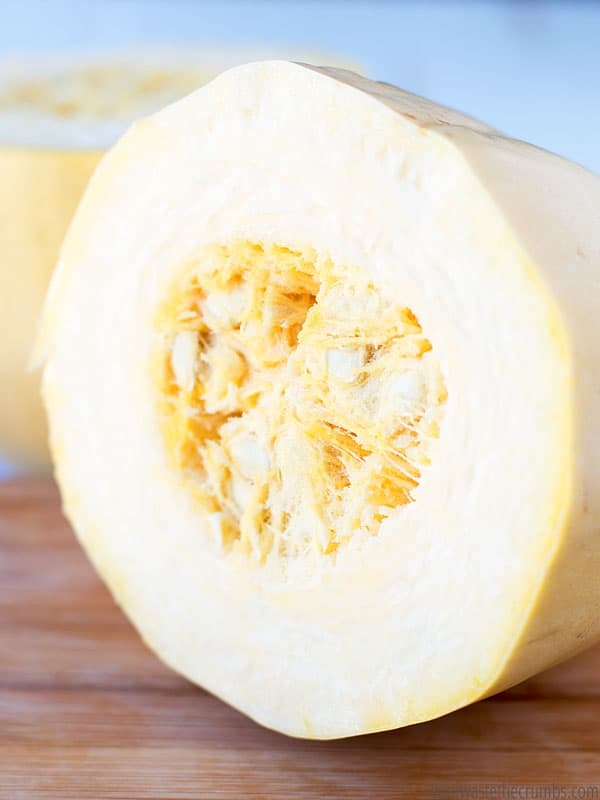 How you cut spaghetti squash is actually important, so let’s talk about it. In half from top to bottom, stem to base. In half around the middle. 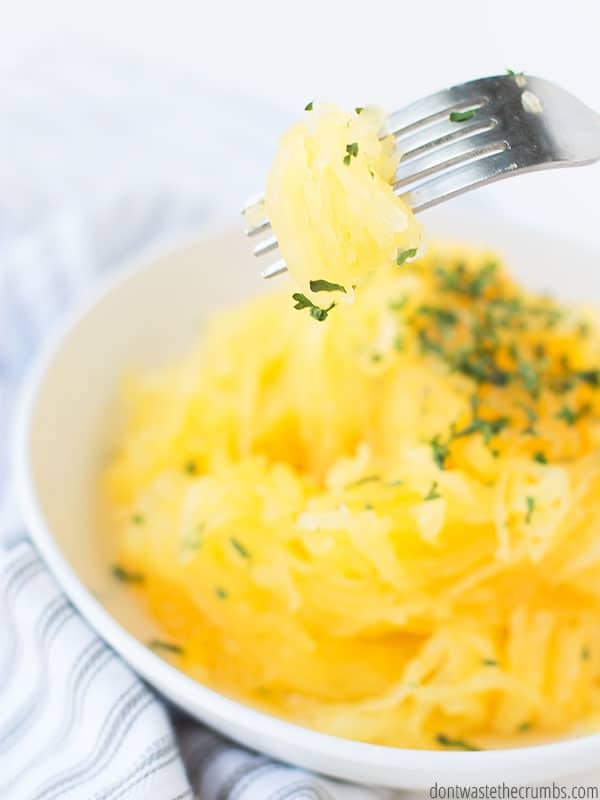 If you cut spaghetti squash from top to bottom, your strands of squash will be short. They’ll still look like spaghetti, but no one will be twirling around their forks at the dinner table. If you cut spaghetti square in half around the middle, you get long, luscious strands of spaghetti squash. And that’s what we want. So cut your spaghetti squash around the middle folks! Once you cut your squash in half (around the middle! ), use a large spoon and scoop out the seeds. If you’re diligent about reducing food waste, save the flesh you scooped out for homemade chicken stock using kitchen scraps. You can then clean and roast the seeds, similar to how you would roast pumpkin seeds! 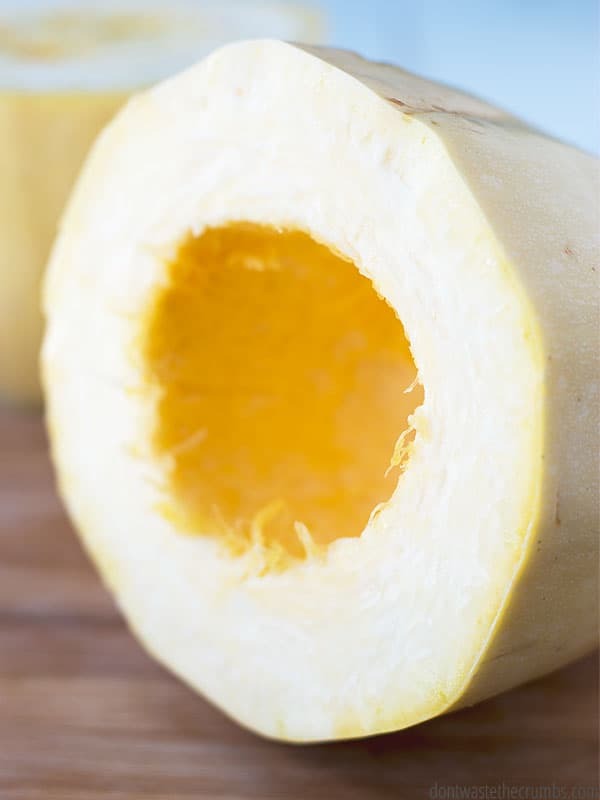 With your spaghetti squash cut and cleaned, you’re ready to start cooking. Or you’re ready to start pushing buttons anyway! 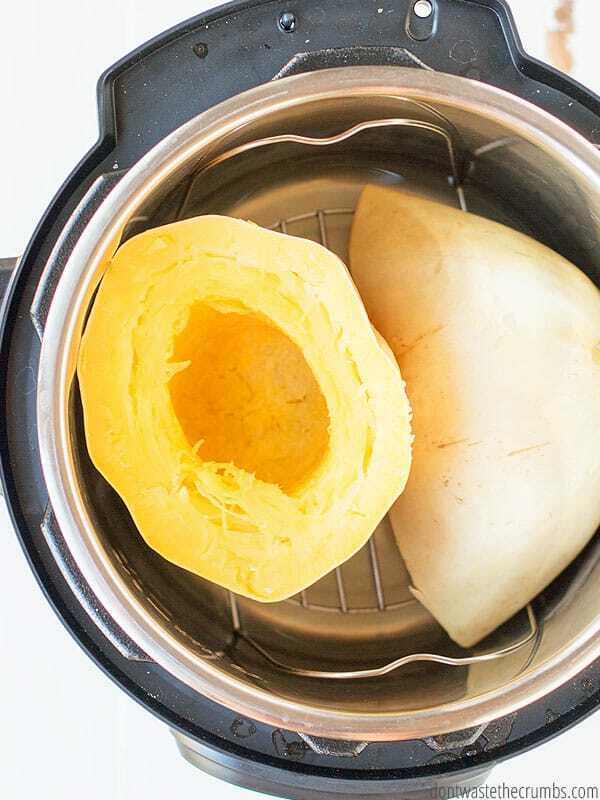 Spaghetti squash takes only 7 minutes in the Instant Pot under high pressure. A quick pressure release ensures you don’t turn your strands into mush and BAM – you’re done. Yep – just like that! I’ve made several spaghetti squash recently, since we’re eating way more vegetables after completing the Whole30, and I’ve noticed that there can be some variation in the texture of your spaghetti squash if you change a few variables. The spaghetti squash will be VERY hot, and too hot to handle right away. I recommend using oven mitts to remove the squash from the Instant Pot and set it aside to cool. Spaghetti squash has a lot of liquid (like watermelon) and it can make your meal a bit watery, so I recommend letting the squash cool upside down on a cookie sheet lined with a cooling rack. This will give air circulation for the squash to cool, gravity will pull out some of the extra liquid and it will collect in the cookie sheet. I have the 8 quart DUO 7 in 1 Instant Pot. I choose the larger Instant Pot for a few reasons. 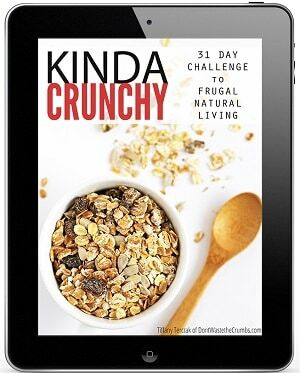 My slow cooker is 6 quarts and can barely fit some of my favorite recipes. Having the larger Instant Pot gives me more room to double recipes, too. 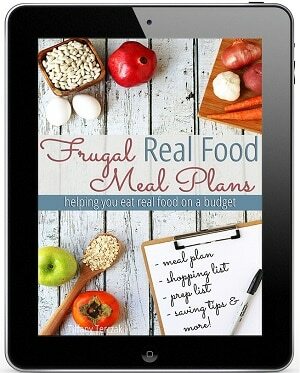 Cooking once and eating twice is key for saving time in the kitchen. 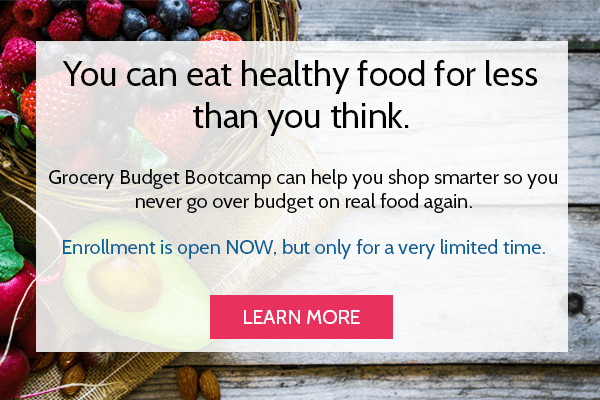 How do I know what size Instant Pot to buy? There are a few things to consider when you choose an Instant Pot. 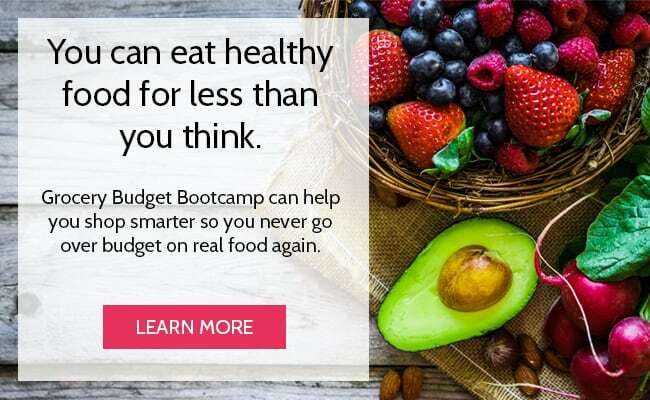 When it comes to size, think about how many people you typically feed, do you want to cook large batches of food, will you be cooking meals or staples (like beans). Besides size, the different models have different functions. The LUX models have a the cake and egg functions, the DUO has the yogurt, bean/chili and poultry functions, and the SMART model is blue-tooth compatible. While the 6 quart Instant Pot is very common because of the lower price point, I recommend the 8 quart since you have more options with it down the road. You can easily cook a 6 quart Instant Pot recipe in an 8 quart. It’s better to have a little extra space than wish you had a bigger Instant Pot. Have you gotten rid of your slow cooker? I still have my slow cooker for now. But it’s been demoted to the basement. I am completely in love with my Instant Pot and am excited to see how I can use it in place of my slow cooker. Is there a texture difference between slow cooker meals and Instant Pot meals? I found the taste and texture of Instant Pot meals to be so much better than the slow cooker. The whole chicken recipe that I use, tastes much more like a roast chicken in the oven. There’s no mushy meat with the Instant Pot! Place the trivet inside the Instant Pot. Pour the water inside. Cut the spaghetti squash in half, around the middle, and scoop out the seeds. Set aside if you're making chicken stock from kitchen scraps and/or roasting the seeds. 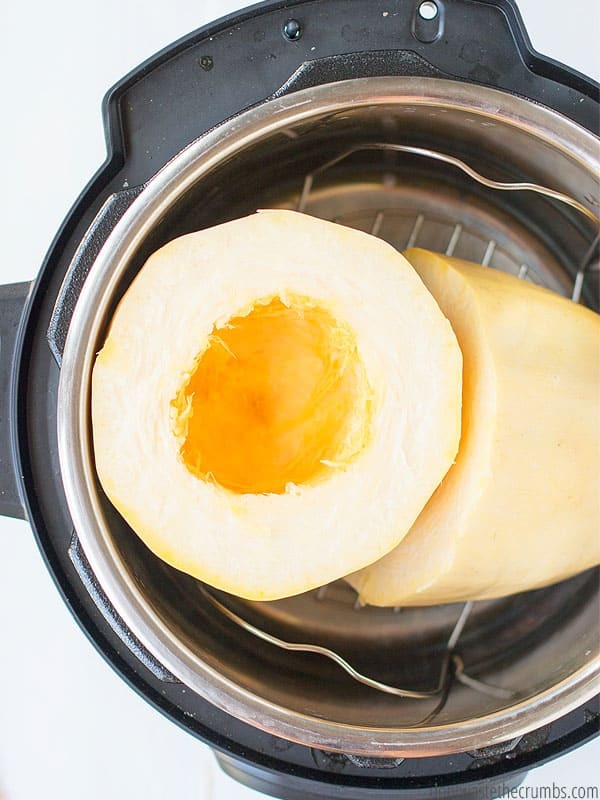 Place the two halves of spaghetti squash inside the Instant Pot. It doesn't matter how you place them (i.e. facing each other or not), so long as you have enough room to close and seal the Instant Pot. Turn the pressure knob to "seal," adjust the pressure setting to "high" and set the timer for 7 minutes. When the timer beeps, carefully turn the pressure knob to "release" to use the quick pressure release method. Carefully remove the hot squash from the Instant Pot and set aside, upside down, to cool, about 10 minutes. When the squash is cool enough to handle, use a fork to gently pull the spaghetti-like strands of squash from the shell. Serve warm with either butter and salt and pepper, or top with your favorite pasta sauce! 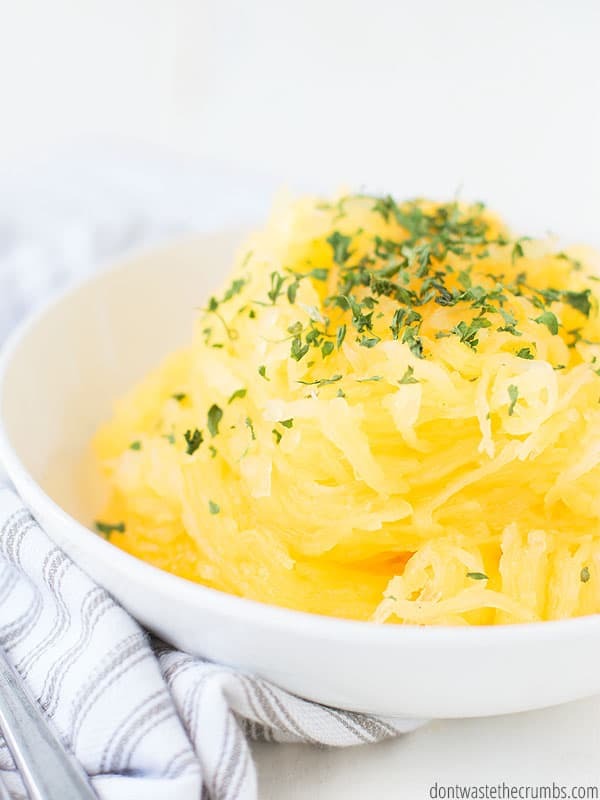 Are you a big fan of spaghetti squash? What’s your favorite way to eat it? I’d love to hear your recipe ideas in the comments section below! i only got problem in removing the hot squash and also in adjusting the pressure setting and adjusting knob. i also had the same problem with ordinary pressure cookers. I let it cool slightly and then use oven mitts to remove the squash.